In other space news today, the boffins in charge of the European Space Agency's LISA Pathfinder mission have wrapped up the final results for the space-based gravitational wave dry run. The Pathfinder carries a pair of 2 kg free-falling cubes, separated by 38 cm and linked with lasers.The masses move relative to each other in response to passing gravitational waves. The whole rig is a Laser Interferometer Space Antenna - or a LISA. The European Space Agency (ESA) sent up the Pathfinder to test the notion that space would allow finer measurements of gravitational waves than an earthbound instrument, ahead of a full LISA launch pencilled in for the year 2034. The LISA Pathfinder team has now published the final analysis of the mission, and said it exceeded the sensitivity requirements that will apply to the full LISA mission. As the ESA explained here, the instrument turned out to be so sensitive that gas molecules bouncing around inside the satellite were sufficient to register as noise. Over the months, those gas molecules escaped into space, leaving the LISA Pathfinder with a much quieter environment. The scientists reckon the end result is that the Pathfinder was, for a while, the “quietest place in space”, and with better statistical analysis, they were able to “measure the noise at even lower frequencies than expected, down to 0.00002 Hz” – 20μHz. 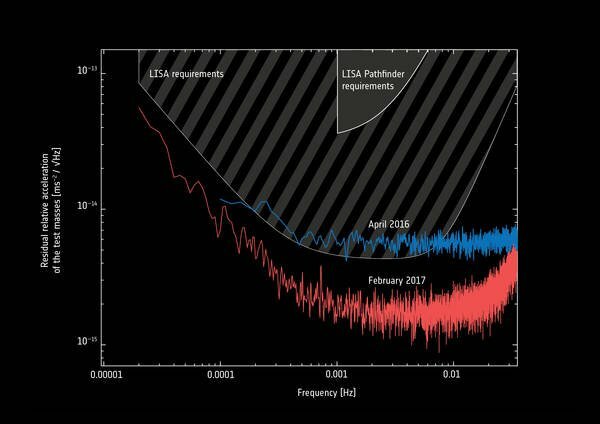 Being able to operate at such extremely low frequencies will let the LISA instrument detect gravitational wave events invisible to Earthly measurements: “It means that instead of only being able to detect a passing gravitational wave from a single event for a fraction of a second, LISA will be able to detect month- or even years-long chatter of multiple signals,” the ESA's statement said. When LISA is operational, the ESA added, low-frequency detection will let it spot “the first signs of a supermassive black hole merger” and alert astronomers to get watching.